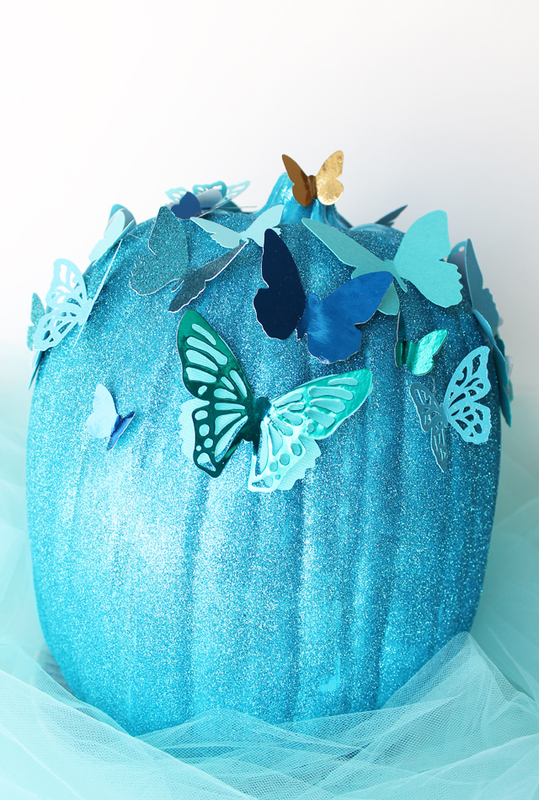 Make your own Cinderella Pumpkin for Halloween — inspired by the new movie and beautiful blue butterfly dress she wears! Who has the new Cinderella movie that just came out on DVD last week? We do! My daughter couldn’t wait to see it again after our entire family enjoyed it in the theater earlier this year. It’s a beautiful version of the classic fairy tale, and I love the message, “Have Courage and Be Kind.” But let’s be honest, what really stole the show for all the girls watching was the gorgeous blue gown Cinderella wears to the ball. It’s sparkly and full of magic, with butterflies delicately placed on the shoulders of the dress. My 5-year-old just had a birthday last weekend and we celebrated with a Cinderella soiree of our own! For one of the party decorations, I turned a regular pumpkin into a version of her butterfly dress. It was definitely a favorite of all the guests! 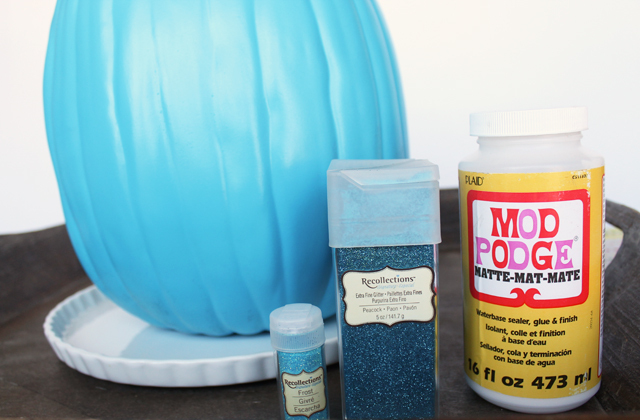 Step 1: Spray paint your pumpkin with a few even coats of Rustoleum Oasis Blue. Once it’s completely dry (I left mine overnight), you can add the Recollections glitter with a thin coat of Mod Podge applied with a foam brush. Brush on the Mod Podge in sections and sprinkle glitter generously to make sure it covers completely. 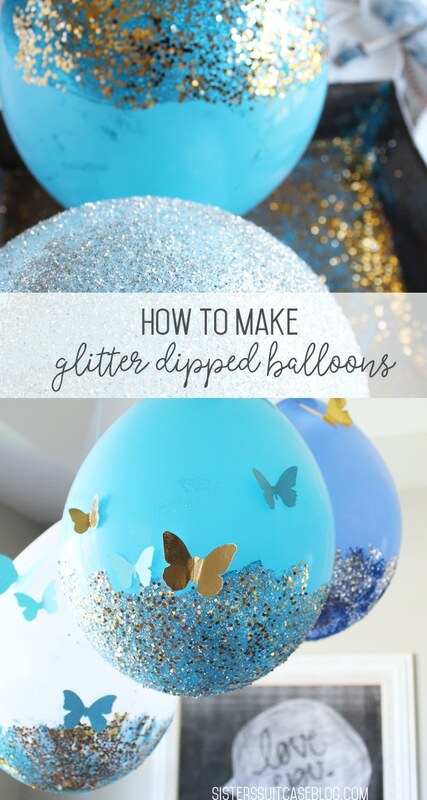 Step 2: Prepare your butterflies! 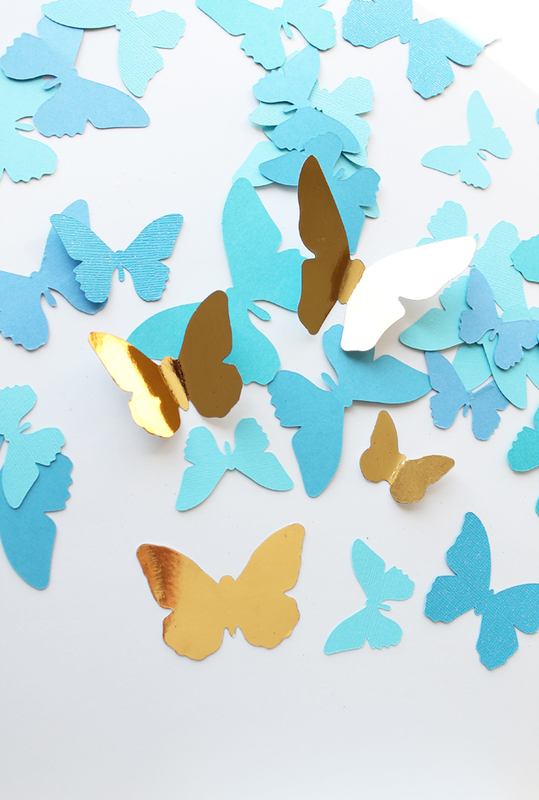 I used my favorite new crafting tool, my Heidi Swapp Minc and a pack of 3D butterflies, along with some other butterflies cut out of regular and glitter cardstock with my Cricut Explore. 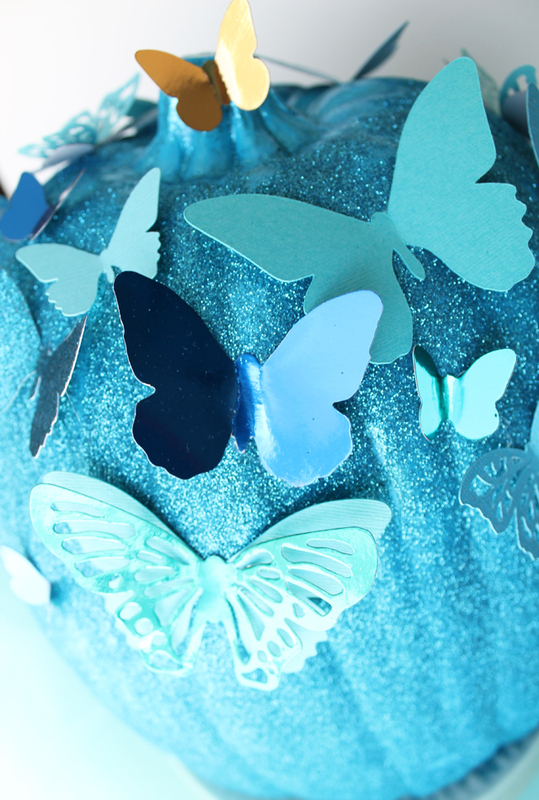 Step 3: Attach your butterflies at the top of the pumpkin with hot glue. I did some single butterflies, and layered some together. My favorite combination turned out to be the Minc foiled butterflies layered on top of cardstock, but all of the shimmery foiled butterflies stole the show! 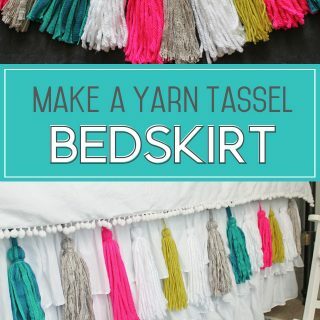 For more project ideas using our favorite new crafting tool, click HERE. 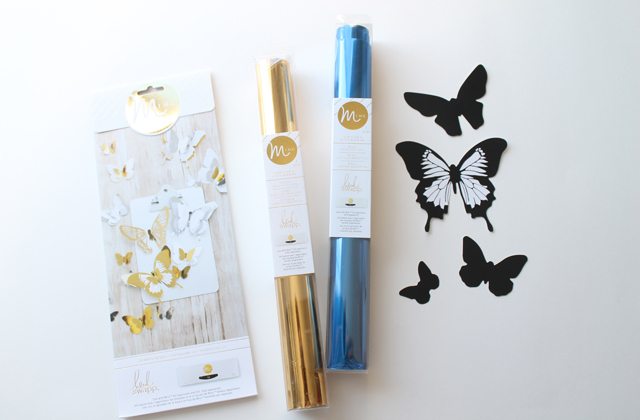 You can find the Minc at your local craft stores like Hobby Lobby and JoAnn, or online from Amazon. I couldn’t be more excited about how this pumpkin turned out! 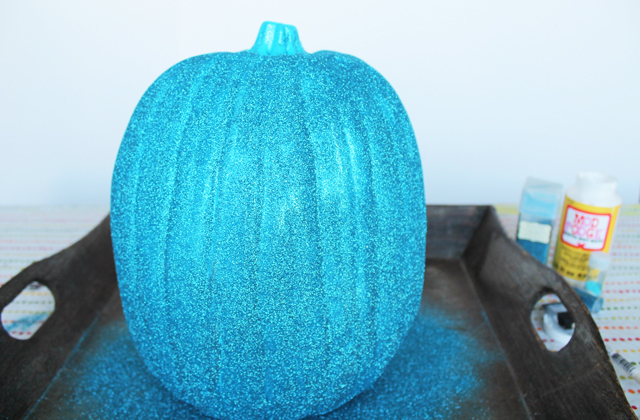 It was the perfect centerpiece for our Cinderella party decor, and now my daughter gets to keep it in her bedroom as a Fall decoration for the next few months. I also created a smaller pumpkin inspired by the golden carriage she rides to the ball. They look so cute together! 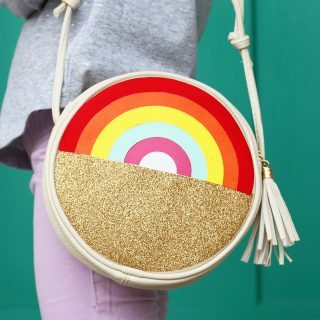 This post is sponsored by American Crafts and contains affiliate links. 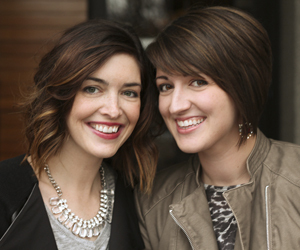 « Back to School Printable + the Perfect Printer for College! Love it!!! My wedding bouquet was made out of silk butterflies. Butterflies also represent a new beginning. Great job!! Really cute! 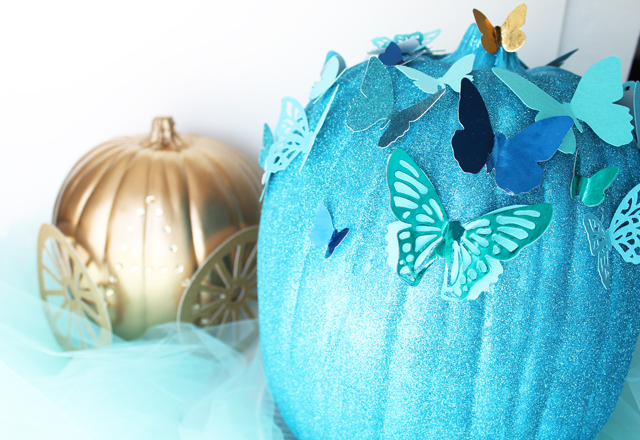 Never thought of mixing pumpkin and butterfly in a project but this looks great! The butterflies got the spook out of the pumpkin and made it magical.